It’s no coincidence that summer time can be the best time to lose weight. You’re spending more time outdoors having fun in the sun, you’re generally in a better mood and the weather is nice enough to grill almost every meal. While we generally think of the grill as being reserved solely for classics like sausage sizzles, burgers or an old-fashioned steak, grilling can be an easy way to prepare a healthy, nutritious summertime meal. From delicious proteins to tasty vegies and healthy desserts, there’s nothing you can’t accomplish on a grill. 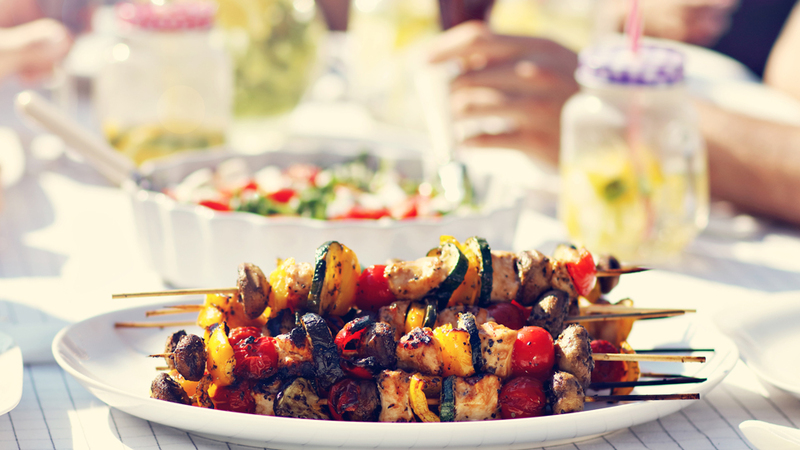 So, let’s fire it up and get ready for a healthy summer with these five healthy-grilling tips. If you’re looking to reduce the calorie count of your meal, stick with fish, skinless chicken breast or ground poultry, like turkey burgers. But, if you have your heart set on a juicy steak, a 170-gram sirloin is the way to go. Our suggestion: grill chicken breasts seasoned with a dry rub, slice them into strips and add them to a refreshing summer salad of mixed greens and a light vinaigrette! Barbecue sauce is easy to overlook when you’re tallying up the calories in a meal. After all, it’s just a condiment, right? But, most store-bought sauces can deliver a surprising amount of sugar and calories in a single serving. In fact, a two-tablespoon serving of your average barbecue sauce can contain up to three teaspoons of sugar, 15 grams of carbohydrates and 60 calories. And if what you’re eating is slathered in the stuff, it’s likely you’re consuming much more than two tablespoons’ worth. Instead of using a sauce, try using a dry rub or marinade for your protein. There are plenty of great store-bought options available, but make sure you keep an eye on the sodium and sugar amounts. If you’re the kind who likes to tinker with different flavour combinations, making a dry rub yourself can be incredibly simple! Proteins usually get all the glory on the grill, but we think vegetables can also benefit from that delicious char flavour. Cut up your vegetables into large chunks you can easily handle with a set of grill tongs (you can dice them into smaller pieces after cooking), season with the spice blend of your choice and toss them on the grill. Once they have the amount of char you’re looking for, you’re done! Why work harder when you can work smarter? Cooking your vegetables and protein together in a foil packet can make for deliciously effortless meals. Not only does the foil seal in moisture and prevent your protein from drying out (we’re looking at you, salmon), the foil-packet approach also lets the flavours and juices from your protein infuse the vegetables. Grilling dessert? You bet! When you grill fruits, the heat caramelises their natural sugars and intensifies the flavours. Chemistry can truly be a wonderful thing! Peaches taste especially good on the grill – drizzle with reduced balsamic vinegar for a delectable dessert. Trust us on that one; tart balsamic and sweet peach is a next-level flavour combo that will impress your friends and make you look like a gastronomic savant. There’s no better way to spend a summer afternoon than eating healthy foods with friends. So, what are you waiting for? Call them up and invite them over to show them how uncomplicated and delicious healthy eating can be! If you’re in the mood for a summer snack while the grill is heating up, check out our snack options!